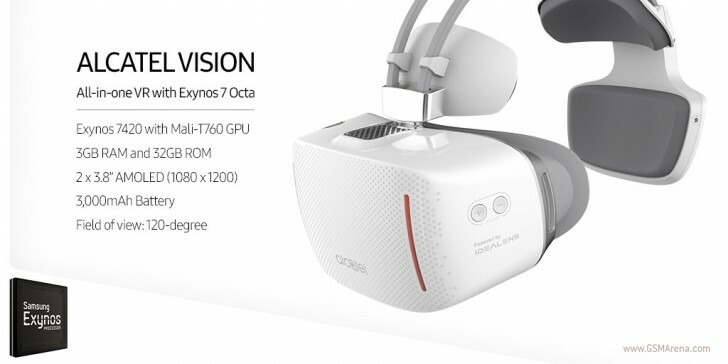 Remember Alcatel's recently unveiled Android-running standalone VR headset called Vision? Of course you do - how could you forget one of IFA's most surprising revelations? In case you're interested in more details regarding the Vision, don't forget to read our hands-on (or is that heads-on?) report about it. One thing that's so far remained a mystery (aside from when exactly it launches and how much it will cost) is which chipset the Vision employs. Alcatel's official documentation only mentioned the CPU was an octa-core one, but that hardly narrowed down the options. Well, today this has been cleared up thanks to the official Twitter account for Samsung's Exynos chipsets. And yes, there's an Exynos inside the Vision. Specifically, we're talking about the Exynos 7420 SoC that powered last year's flagship line from Samsung (including the Galaxy S6 and Note5). The Alcatel Vision also boasts 3GB of RAM, 32GB of storage, a pair of 3.8-inch AMOLED screens with 1,080x1,020 resolution for each eye (note that "1200" in the image above seems like a typo), a 3,000 mAh battery, and 120-degree field of view with 17ms latency. This device is just for basic entertainment. Would be good if you could use the screen wired/wirelessly with other devices. An refurbished Galaxy S6 plus an Galaxy VR is more money for the buck $$$! It's like a walking S6 + Gear VR. Hahaha. I wonder if Alcatel was Samsung's testibg ground before the officual Vear VR remake next year?